This NEW limited edition print by Bruce Robinson was launched at Joey's Bar on 17th May 2013 . 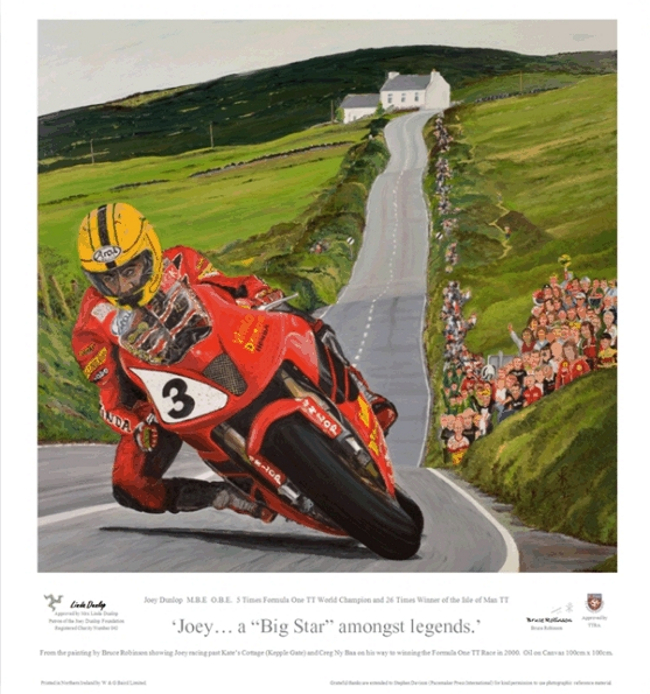 By artist, Bruce Robinson, it shows Joey racing past Kate’s Cottage (Kepple Gate) and Creg Ny Baa on his way to winning the Formula One TT Race in 2000. 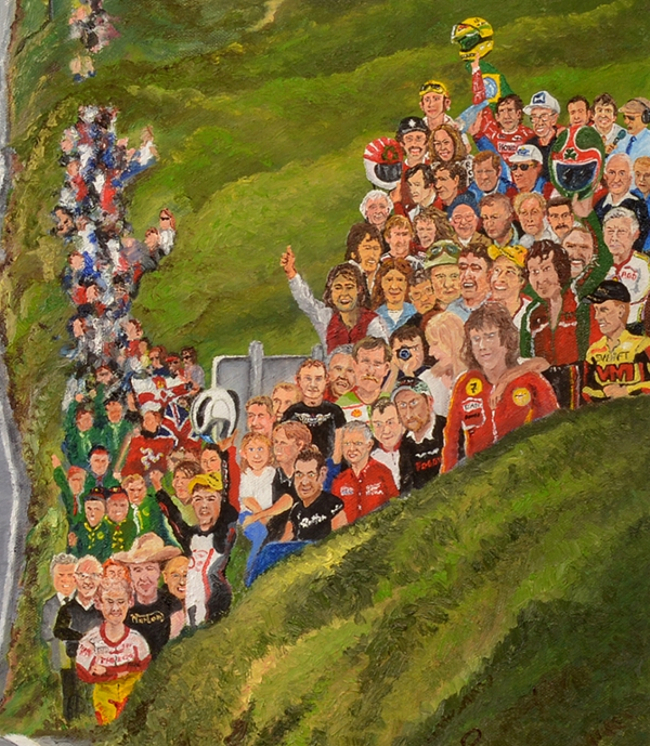 It's a fairy tale TT victory painting of Joey's year 2000 victory with a crowd featuring key figures from the Joey Dunlop story. The edition is limited to 1000 prints of which 900 will be for sale with the remaining 100 to be given to those depicted in the painting or to a relative where applicable; and also to charitable/biking organisations. It is approved by Linda Dunlop and approved by the TTRA. A percentage of the proceeds from the sale of each print will go to the Dunlop family, The Joey Dunlop Foundation, TTRA, the Garryduff Presbyterian church where Joey is buried and Christian Motorcyclists Association. The original was in oil on canvas. The print is on linen textured paper, individually signed and numbered by the artist. The print will also come with a Key to the figures that may be framed with the print; or framed separately or stuck to the back of the frame. Prints will be dispatched in a cardboard tube with plastic end caps. £10 to post within the UK - Next Day Delivery (if posted before 12 noon). £13 to post to Europe - 3 to 5 Days International Signed For Delivery. £15 anywhere else - 5 to 10 Days International Signed For Delivery. Grateful thanks are extended to Stephen Davison (Pacemaker Press International) for kind permission to use photographic reference material. Following initial education at the High School and then The Academy in Omagh, Bruce attended Art Foundation in Liverpool. He gained his Honours Degree in Fine Art with English and Drama from the University of Nottingham. Subsequently he qualified as a teacher of Art and English with a Post Graduate Certificate in Education from the University of Ulster in Coleraine. After a successful career focused on adult learning and development that culminated with him running a company in Oman, he has returned home to pursue his love of painting. He specialises in 'figures and the environment' and tends to work mostly with oils. Yet, he is always interested in learning new skills and is currently focusing on his drawing ability using the metal point technique favoured by the old masters. His love of racing and admiration for the road racing legends is borne out of the fact that Northern Ireland is blessed with having so many top quality racing events at hand and also with the Isle of Man being so close. Growing up with the North West was a fact of life where it was among the highlights to be looked forward to each year to watch a host of personalities put on a great show. Of these Joey was extra special in many ways. As such it was pretty special for Bruce to complete the initial painting and gain the endorsement of Mrs Linda Dunlop. He is looking forward with anticipation to a successful print launch from Joey’s Bar and hopes that many folk will enjoy the work for many years to come. In their own way it is hoped that the paintings will add to the ever growing tribute to a sporting hero and true legend. 1. Willie Dunlop – Father. 2. May Dunlop – Mother. 3. Michael Dunlop – Nephew (Robert’s son) and road racer. 3 Times winner of the TT. 4. Robert (The Mighty Micro) Dunlop – Brother and Competitor. 5 Times winner of the TT and record setting 15 Times Winner of the North West 200. 5. Stephen Davison – Photographer. 6. William Dunlop – Nephew (Robert’s son) road racer and podium finisher in the TT. 7. Barry Sheene M.B.E. – World Champion Grand Prix Motorcycle Racer. Although he raced twice on the Isle of Man he ultimately felt the TT circuit was too dangerous. In the 1980s Barry was arguably the best on tracks while Joey was the best on the roads. 7b. Stephanie Sheene – Wife of Barry. 8. Geoff Duke O.B.E. – Road racing Legend who won 6 TTs and 6 World Championships. 9. Julie Dunlop – Daughter. 10. Donna Dunlop – Daughter. 11. Gary Dunlop – Son. 12. Richard Dunlop – Son. 14. Joanne Dunlop – Daughter. 15. Linda Dunlop – Wife. 16. Michael Rutter – Road racing competitor and double winner of the TT. 17. Neil Tuxworth – Road racing competitor (4 TT Podiums) and Honda Racing Team Boss. 18. Steve Hislop – Road racing competitor and Team Mate, 11 times winner of the TT and British Superbike Champion. 916. Carl Fogarty M.B.E. – Road racing competitor and Team Mate, 3 times winner of the TT and the most successful World Superbike Champion with 4 Championships. 19. Phillip McCallen – Road racing competitor and Team Mate, 11 times winner of the TT, including four victories during one week in 1996. 20. Bob McMillan – Honda Racing Team Boss. 21. Graeme McGregor – Road racing competitor and Team Mate, 2 times winner of the TT. 22. Bruce Robinson – Artist. 23. Merv Robinson – Member of the ‘Armoy Armada.’ Road racing competitor and one of his closest friends. Very successful on Northern Irish circuits and raced once at the TT. 26. Jim Dunlop – Brother, road racing competitor and member of the ‘Armoy Armada.’ Competed in the TT on 7 occasions with best finish in 7th place. 27. Brian Reid – Road racing competitor and member of the ‘Dromara Destroyers.’ 5 times winner of the TT and double winner of the Formula 2 World Championship. 28. Ray McCullough – Road racing competitor and member of the ‘Dromara Destroyers.’ Ray was the man to beat in Northern Ireland in the early days of Joey’s career. 29. Bob McIntyre – 3 Times winner of the TT and the first man to lap the circuit at 100mph. 30. Owen McNally – Road racing competitor and 2 times podium finisher in the TT. 32. John McGuinness – Road racing competitor and Team Mate, 19 times winner of the TT and still going strong with the Honda Legends and Honda Padgett’s Teams. 33. Tommy Herron – Road racing competitor and 3 times winner of the TT. He taught Joey how to race on short circuit race tracks. 34. David Jefferies – Road racing competitor and 9 times winner of the TT. 35. Mike Hailwood M.B.E. G.M. – ‘Mike-the-Bike’ 14 times winner of the TT and 9 World Championship titles. It was a major achievement for Joey to initially equal Mike’s TT tally and then raise the bar to 26 for others to follow. 36. Giacomo Agostini – Road racing legend and 10 times winner of the TT. 37. Billy Nutt – Race Promoter and long term friend. 38. Danny McCook – 1st Sponsor and owner of the firm Joey worked for, fixing lorries. 39. Sammy Graham – Mechanic. 40. Bertie Payne – Long term sponsor and often part of his Pitt Crew. 41. Andy McMenemy – Long term friend and sponsor. 42. John Rae – Early days sponsor. 43. John Harris – Long term sponsor who sadly collected the last 2 trophies on Joey’s behalf. 44. Brian Coll – Country and Western Star and long term supporter and 1 time pillion passenger on the Isle of Man TT Circuit. 45. Hector Neill – Early days sponsor. 46. Valentino Rossi – 9 times Moto GP World Champion, acknowledged as the GOAT (Greatest Of All Time) he did a parade lap of the TT Circuit in 2009 and afterwards spoke of his admiration for the riders and said, "Unfortunately I never knew Joey personally but I remember well that he was 'The King of the Mountain' and rode in that famous yellow helmet. I know all about his success on the Isle of Man and he was a real legend." 47. Roger Marshall – Honda Team Mate and arguably his greatest road racing competitor. 48. Ron Haslam – Road racing competitor with 3 World Titles and 4 British Championships and a TT victory, he led thousands of bikers around the TT Circuit in tribute to Joey. 49. Davy Wood – Long term friend and Manager. 50. Barry Symmons – Honda Team Manager who once saved Joey in a race incident in Portugal by throwing a bottle of water at a competitor who was breaking pit regs & nearly collided with Joey. 51. Geoff Cannell – Manx Radio Presenter and Race Commentator. 52. The Honourable David Cretney – Member of the Isle of Man’s House of Keys and as minister of Tourism, presented Joey (the 3rd Recipient) with a replica Sword of State. 53. Ayrton Senna – Widely held as the Greatest F1 driver of all time he won the F1 Motorcar World Championship 3 Times with Honda. Joey visited the site of his tragic accident at the Imola circuit in Italy in order to pay his respects. Individually they both made the yellow helmet famous. 54. Soichiro Honda – Founder of the Honda Corporation who once said, “when you’re winning the TT you’re selling bikes!” Joey was Honda’s longest serving racer (under contract for 18 years). 58. Paul Bird – Sponsor and owner of the Vimto Racing Team.